Many Thanks to Ger for the beautiful pictures and enthusiasm. 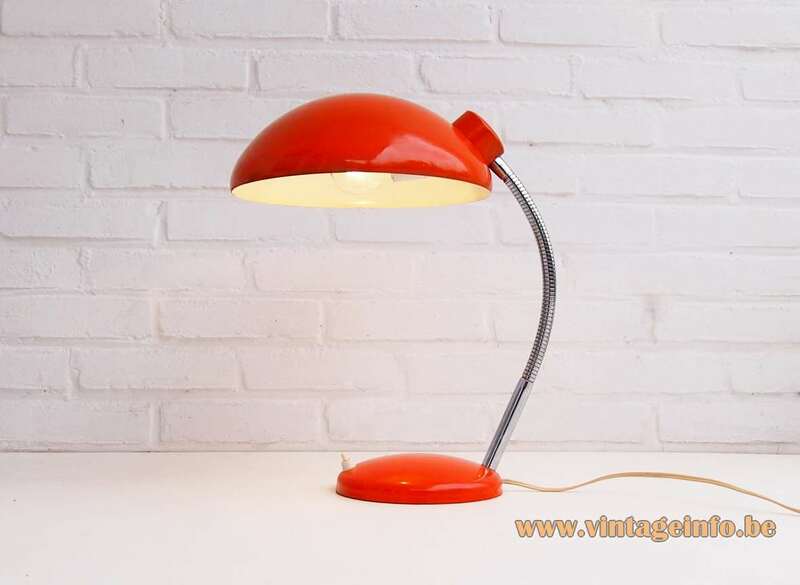 Materials: Dark orange painted round lampshade and round base. The lampshade is painted white inside. 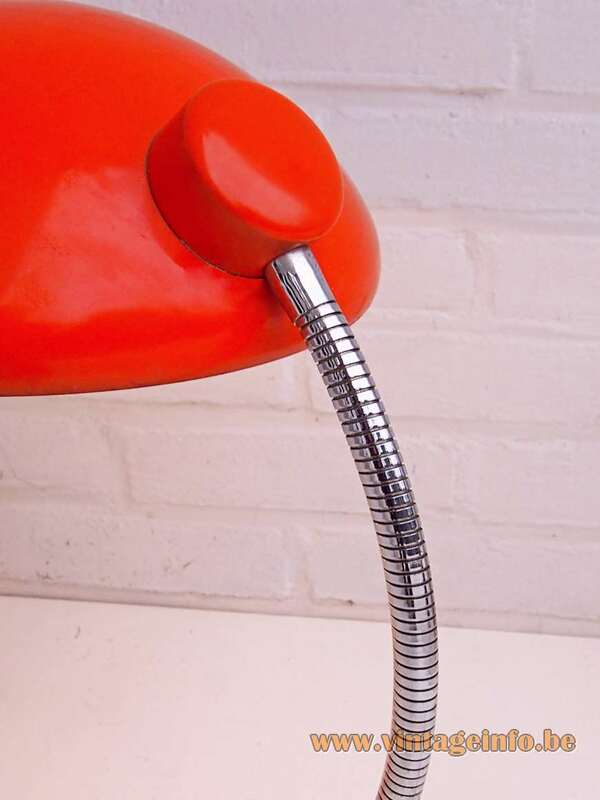 Chrome gooseneck, Bakelite socket. Switch on the base. Period: 1970s – Bauhaus/art deco style. Manufacturer: Massive, Mortsel, Kontich and Wommelgem, Belgium. 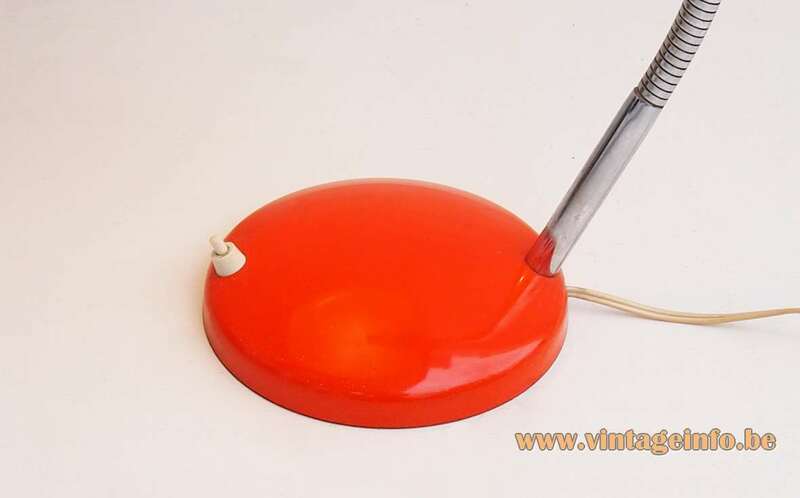 Other versions: Early models such as this one have a round light switch. Later versions, produced since the late 1970s have a rectangular switch. You can find one over here. Made in several colours. 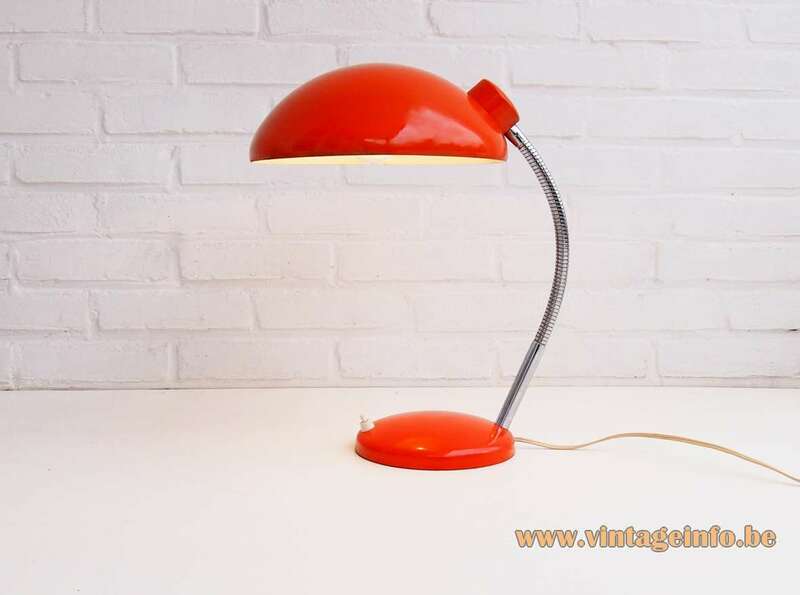 Massive produced this lamp for many years, until the late 1980s. 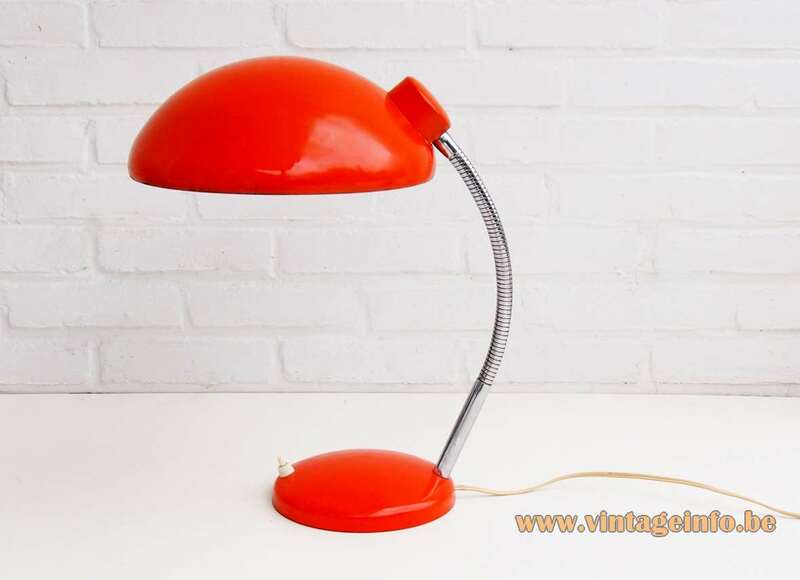 Often confused with the lamps Christian Dell designed, the Kaiser Idell desk lamps or lamps such as the Luxus lamp by Helo Leuchten. Today in production by Fritz Hansen. Label inside the lampshade: Mass. Max. 60W. Made in Belgium (Massimo Maximum 60 Watt). Massimo is the Italian word for maximum. Max. 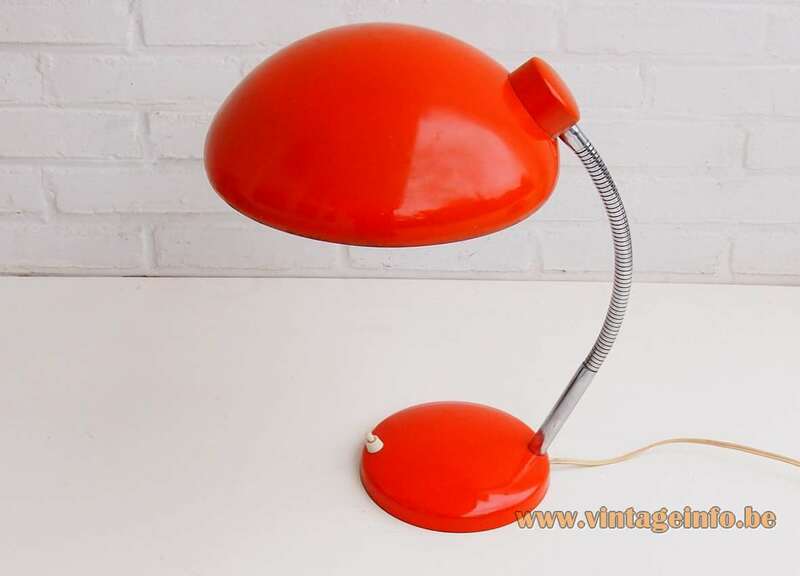 is used for every other language in Europe were Massive sold lighting at that time. At Massive they were economical with the labels, they started using labels when the government had compelled them to do so. The first labels that became mandatory in Europe (EEC) were stickers that stated the maximum power of the light bulbs to be used. Massive used the same round labels with the same font that says: Mass. Max. 60W., Made In Belgium and also a label exists with Massive Mass. Max. 60W. More info about the Massive Labels can be found over here on Vintageinfo.